An integrating-sphere system has been designed and constructed for the measurement of multiple optical properties in the infrared spectral range. 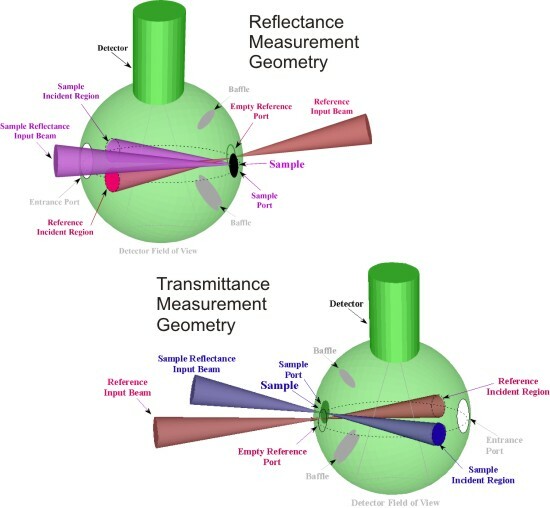 The absolute transmittance and reflectance can be measured directly for both diffuse and specular samples, and the absorptance or emittance can be obtained from these by simple calculation. The inside wall of the sphere is coated with a material (plasma sprayed copper on a brass substrate, electroplated with gold) that is nearly a Lambertian diffuser that also has a high directional hemispherical (diffuse) reflectance – about 0.9 for the infrared spectral range. There are entrance, sample, and reference ports, all centered on a great circle of the sphere. The detector's field of view is centered on the same normal and corresponds to the bottom region of the sphere. The sample and the reference ports are located symmetrically with respect to the entrance port. The Hg:Cd:Te (MCT) detector Dewar is mounted on the top of the sphere. A pair of rotation stages underneath the sphere is used to move the sphere into positions for both reflectance and transmittance measurements. Heated samples can also be measured with the integrating sphere. For temperatures below 600 K the sample temperature is determined from PRT or TC sensors embedded in the sample mount, or in the sample itself. The sample heater/mount can also be used to measure transparent samples. There are four interchangeable internal heat exchangers. Two use electrical heating for higher temperatures to 200 °C: one solid holder for opaque samples, and one ring holder for transparent samples. Two similar heaters use liquid from a temperature-controlled bath recirculator unit for temperatures between 270 K and 350 K. The ring shape of two of the heaters does not obscure the central region of the sample, allowing light to pass through for a transmittance measurement, as well as allowing the transmitted component to be diverted and absorbed in a reflectance measurement. For opaque samples, the solid heaters are used to obtain the best temperature uniformity. A Fourier transform spectrophotometer serves as the spectrally tuned light source. Further details of the absolute measurement methods used with the integrating sphere can be found in the references below.